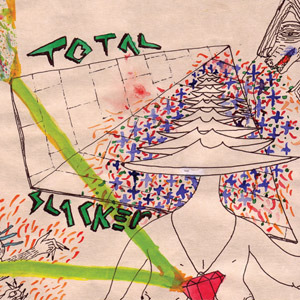 Brooklyn's garage-prog-jammers known as Total Slacker have been paying their dues throughout the greatest borough for the better part of the past year. In fact, they play so often, chances are they've been on a bill you didn't even realize they were playing until you got there. Now their songs are starting to trickle out on recorded form, and we're excited to say one of their first official releases will be an Impose 7-inch. They've also got a FMLY cassette in the works, which is due out around now, so it's hard to say which one is the actual “first.” But it doesn't matter, because with so many shows, they'll need the product to keep the tour van fueled. The Crystal Necklace 7-inch features the title track on the A-side with “Video Store Rental Guy” on the B, and exclusive artwork on the cover done by bandmates Tucker Rountree and Ross Condon. It officially comes out in all forms on July 6, but you can pre-order it now to ensure you have a copy to help wake up from your July 4th hangover.